Estate jewelry can take on many different definitions. 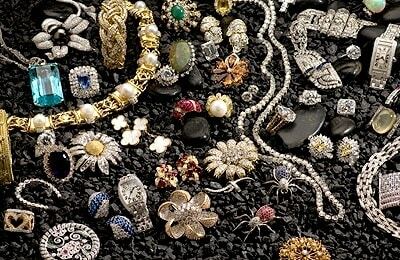 Many people simply assume that it's old jewelry, stuff that's been passed down from generation to generation in our family when in actuality it just refers to jewelry we've had in our family or sitting around the house for a good deal of time. This is typically silver of jewelry, and if it is a piece of older jewelry, then most likely it has precious gemstones other than diamonds which is totally fine. Most of the value in estate jewelry comes from the metal that is in the piece, typically either gold or silver. The weight of this is what is used to generate the value of your piece of jewelry. Gold in particular can fluctuate in value, so if you want an idea of the value of your jewelry look on the inside of rings, or on the clasp of necklaces/earrings/bracelets and you'll see 10K/14k/18k/24k indicating its purity. The higher the better meaning the more amount of cash you can get. Feel free to stop on by to have your gold or silver estate jewelry evaluated free of charge, with the highest prices in Casa Grande, Casino Pawn and Gold is the only place you should turn when you're looking to sell estate jewelry. We also update our prices daily to reflect the actual, global gold/silver selling prices so you can rest assured you're getting the most money any Casa Grande pawn shop has to offer. These are all legitimate reasons to sell your jewelry. We offer the best value when selling whether it’s plain old scrap gold, an expensive diamond, or an antique piece of jewelry from grandma. Please allow us to buy or bid on your jewelry. We serve Tempe, Scottsdale, Mesa, and Chandler. We Buy and Sell Silver, Gold, Platinum, Diamonds, Watches. Sell your gold, diamonds, coins and watches for top cash. Sell us your scrap gold and broken jewelry too. If you have a gold or jewelry item not listed anywhere, that you believe we may be interested in, please call us now to speak with our top appraisers and specialists in Tempe.